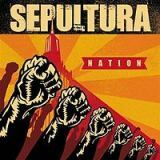 SEPULTURA - NATION (CD) | Online Shop | Wizard LTD.
- Q magazine (5/01, p.118) - 3 stars out of 5 - "A clutch of crowd-pleasingly brutal anthems...with a return to the more exploratory approach of old....the faithful will not be disappointed." - Alternative Press (5/01, p.63) - 4 out of 5 - "There are plenty of touchstones to [their] days of headbanger hegemony....[new singer] Derrick Green's heightened tunefulness along with the broadened emotional resonance...should relate to an enlarged fanbase." - NME (3/31/01, p.31) - 6 out of 10 - "Fiercely political and uncomprimisongly direct....it's taut and tense and if you buy it quick you'll get to hear their logic-defying cover of Bauhaus' 'Bela Lugosi's Dead'." Nation is the band's second album with singer/guitarist Derrick Green. Nation features guest appearances from such notable artists as Hatebreed singer Jamey Jasta, Dead Kennedys singer Jello Biafra, Ill Niсo singer Cristian Machado, Bile frontman Krztoff, and Apocalyptica. According to the official site, a video for One Man Army was scheduled to be filmed at the end of August 2001. However due to a lack of support from Roadrunner Records, the video was unfortunately never made. The album saw generally better reviews than Against, but sold fewer copies than it. Sepultura blamed Roadrunner Records for not promoting the album enough, and left for SPV Records in 2002. Nation has sold over 80,000 copies in the USA , and went gold in Brazil.